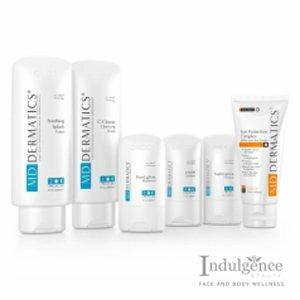 Currently used by Dermatologists, Medical Professionals and Professional Aestheticians to treat a wide range of skin concerns, the MD Dermatics Skin Rebirth System has been proven to work beyond the surface of the skin, targeting your problems at their source, stimulating healthy cell renewal and fortifying the skin from within. The DERMATICS® Skin Rebirth System was designed by Dermatologists and developed by our skin scientists under high standards and stringent controls in laboratories based in the United States. Our FDA approved range of Skin Health products contain a unique blend of botanical extracts, vitamins and skin renewal formulas that are designed to bring the Skin Health to an optimum level, alleviating the skin problems that many people experience today. 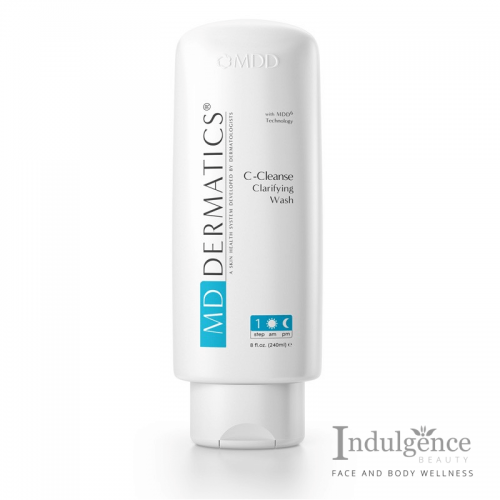 Currently used by Dermatologists, Medical Professionals and Professional Aestheticians to treat a wide range of skin concerns, the MD Dermatics Skin Rebirth System has been proven to work beyond the surface of the skin, targeting your problems at their source, stimulating healthy cell renewal and fortifying the skin from within. I’m now on my 2nd Skin Rebirth Set already and now I can’t live without these products. After using every day, now I have more uniform glowing skin. I noticed the results very quickly with 2 weeks of using it. Even my friends and colleagues have notice it and have gotten so many compliments on my GLOW and i know it’s these products just doing their thing. My pigment have not completely disappeared but it is very much lighten. Thanks to Indulgence Beauty for their constant following up too. Had been using this product for about 3 weeks now and I already notice the difference in my skin. The blemishes and hyperpigmentation is slowly fading away and my skin is definitely more glow and radiant now. I have been using this skin rebirth system for the past two months and saw that my pigments and dark spots have been lighten. Was recommend to use the retinol enhancer with nightlight and now feeling the glow on my skin. Had used many different brands of product but none give me this results, Very happy over all with this products. I had seen wonderful results in a pretty short time. It does lightened dark spots from my acne scars and pigments and gives my skin a radiant glow. Very happy with the product. Great sharing of the products information from Indulgence Beauty too, very informative and professional unlike some other salon. I love MD Dermatics Skin Rebirth System and had used quite a few different brands before but didn’t have much success unlike the results by them. Had been using it for the past 3 years and would recommend to all.. I am absolutely thrilled by the results – in just 3 weeks my skin looked younger and had my pores diminished. After my pregnancy i see dark spot on my skin and after using 1 set, i see my skin back to a healthy glow!! Simply loves the compliments from my hubby and friends after using the skin rebirth set, love the porcelain glow so much. Thank you. Awesome product. I wish I had got to know this product earlier. Had began to notice a great difference in discoloration within days of use and has continues to improve. Was advice by Indulgence Beauty to use it with retinol enhancer and it really enhance the results. The past products i used dont have such efficacy. I am a 28 years old male, had very bad acne scarring and blemish during my teens. 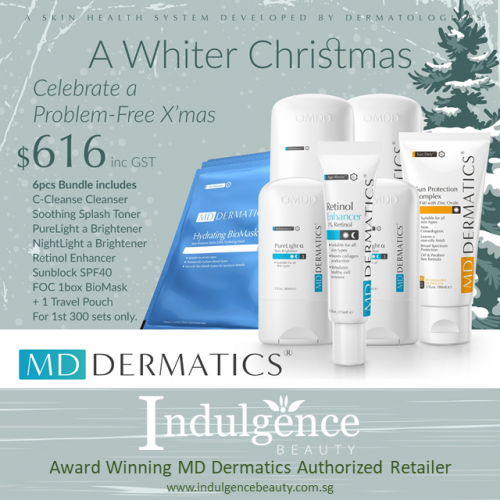 Had been looking around for good product to treat my skin and chance upon a complimentary skin analysis from Indulgence Beauty and went for it. Had a very detail consultation by Anna ( Thumbs Up for her ) and she had recommended this skin rebirth set to me. Great recommendation!! She had coupled Revita Peel treatment for me and the results is tremendous ! !